In the light of recent events surrounding Coinbase, a growing number of crypto users and enthusiasts are exploring new solutions to boost their anonymity, privacy, and security. At first, there was a suggestion by Coinbase to store users private keys on their personal cloud storage, followed by worrying news of the acquisition of the forensic blockchain analysis firm Neutrino, whose leading managers are former members of the scandalous Hacking Team. 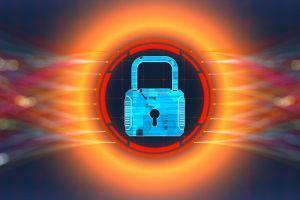 The series of events brought the community’s attention to the role of blockchain analytics firms like Neutrino, Chainalysis or Elliptic, and the ways they can supposedly compromise one’s privacy. However, both Chainalysis and Elliptic deny any wrongdoings. It’s no secret that, at first, Bitcoin gained prominence and recognition as an anonymous dark web currency. To this day, many outsiders believe it is best suited for illegal activities like buying and selling illicit goods or money laundering. However, Bitcoin is pseudonymous at best. Due to the transparent nature of Bitcoin’s ledger, there is no surefire way to remain 100% anonymous. Meanwhile, privacy and anonymity are crucial elements for everyone who wants to keep their funds safe against third-party attackers. So, what are your options to maximize your privacy using Bitcoin or other crypto assets? A great place to start is by choosing a credible privacy-oriented crypto wallet to store your digital assets. Here are some of the popular privacy wallets that will help you to level-up in the game of “Where’s Waldo” in terms of using Bitcoin and cryptocurrencies. Built-in IP-address anonymization with TOR (The Onion Router) and VPN (Virtual Private Networks) support. Generates a new public address with every new transaction. Alerts that don’t let you use the same address. Ricochet send, which sends your transaction through multiple BTC addresses before reaching the destination account to bypass such measures as address blacklisting. Stonewall transaction protection that increases the difficulty of linking transaction inputs, outputs, and metadata. 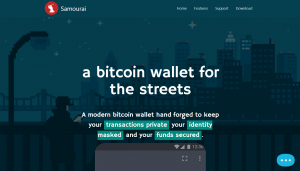 At the moment, Samourai wallet is available only for Android devices. The iOS version in the making. Wasabi is an open-source, non-custodial Bitcoin privacy wallet. It is packed with advanced privacy features just like Samourai wallet except it is designed to run on desktop computers. Despite the myriad of options, Wasabi has a user-friendly interface and intuitive design making it relatively easy to set up and run. Integrated Tor anonymity and VPN service. Hierarchical Deterministic (HD) wallet that generates native segregated witness (SegWit) addresses. Trustless Chaumian CoinJoin mixing which enforces a constant 100 anonymity set. Another cool feature of the wallet is that you can rate the privacy level of each transaction, which lets you reevaluate and reinforce the fungibility of your transactions and coins. 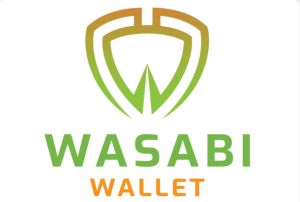 Wasabi wallet is available on many desktop operating systems, including Windows, macOS, Ubuntu, and other Linux variations. 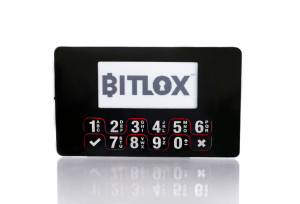 BitLox lets you create up to 100 distinct wallets, including hidden ones with an unlimited number of addresses. BitLox Advanced. Lets you keep up to 100 wallets with countless addresses. BitLox Ultimate. Supports the ability to hide up to 50 of your created wallets. BitLox Extreme Privacy Set. A complete set of Bitcoin hardware wallet and a military grade USB vault with the preinstalled Tails operaring system with Tor-compatible web tool. All variations of the wallet come with a 5-year guarantee. So far, the wallet supports only Bitcoin, but support for Ethereum and other altcoins is in development. 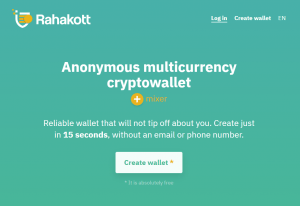 Rahakott wallet is an anonymous web multicurrency wallet designed to protect users privacy and anonymity when transacting in multiple cryptocurrencies. The list of supported coins includes Bitcoin, Ethereum, Litecoin, Bitcoin Cash, Monero, Zcash, and Dash. Can be accessed on Tor network. The only way to recover your account is via mnemonic seed phrase. Other security measures include two-factor authentication (2FA), one-time password (OTP), supports four languages (English, Chinese, Russian, and Japanese), and features SegWit integration. Electrum is the old-timer of the industry. It’s a lightweight Bitcoin wallet available for Windows, Linux, Android, and MacOS. Although it is not anonymous by default, it can be highly private if used on the Tails operating system. Running Electrum on Tails routes all your traffic through Tor and makes it harder to track you. Long track record and community’s trust. 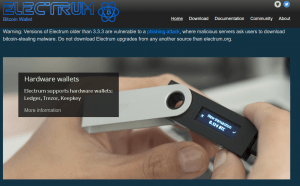 Electrum also integrates with popular hardware wallets such as Trezor, Ledger, and KeepKey. Unfortunately, though, Tails OS is impossible to install on mobile devices, and the wallet’s interface is rather uninviting for the beginners. These are some of the best privacy wallets available as of 2019 March. Other wallets that are often referred to as having at least some privacy-enhancing features are Armory, Coinomi, Edge, Breadwallet, MyCellium, Bitcoin Core Wallet, Xapo Bitcoin Wallet, GreenBits, Jaxx, mSIGNA, Multibit, Exodus, KeepKey, and wallets by Ledger and Trezor, so feel free to check them out while looking for the most optimal solution.